Over spring break this year my family and I did a tour of the national parks, starting and ending our vacation in Las Vegas, one of the most light polluted locations on Earth. But McCarran International airport made for a good spot to begin our travels first to Utah’s national parks, then to Great Basin National Park in Nevada along the loneliest highway in America, and finally to Death Valley National Park in California, before the short jog back to Las Vegas. If you look at a map of light pollution in the United States, all the major cities and even highways stand on with their white orbs bleeding into the countryside and strung together by cities and towns that provide passage from one metropolis to the next. But there are still plenty of dark sky sites in the US, with most of the vast tracts residing out west. Even though there is a lot of countryside in Wisconsin, where I live, you can’t drive more than a couple minutes before running into the next farm house, even when you’re far from the big cities. But out west you can drive for an hour or more before encountering any sign of life. Traveling through Nevada from the northeast to the southwest, we’d been driving for an hour or more before I managed to spot one lone cow across some of the flatland, grazing near the base of a mountain. So when we arrived in Death Valley, we knew that except for minor lighting in the park, we’d have dark skies. In fact, Death Valley has been named an International Dark Sky Park and is currently the largest with that title. While park rangers commonly run nighttime observing programs for visitors, there wasn’t one available the nights I visited, so I held my own for my family in Furnace Creek Ranch after dark. The biggest problem with observing at a site that is substantially darker than what you’re used to is simply orienting yourself. With more stars visible, the constellations can look a bit unfamiliar until you have your bearings. My family and I watched satellites cruise across the spring constellations and then looked west to where the winter constellations of Canis Major, Orion, and Gemini were setting behind the mountains rising up on the far side of the valley floor. As our eyes adjusted to the dark, I began to notice a lighter, grayish patch of sky in the west that was wide near the horizon but tapered upward into a triangle shape. In fact, it was so easy to see that for a moment I thought maybe I was looking at the hazy span of the Milky Way that can be seen from my own backyard. But I knew that this was not the right orientation or shape of the Milky Way, and what I was actually seeing was dust in the plane of our solar system that is known as the Zodiacal Light. The waning moon had not yet risen, allowing our skies to be as dark as possible and for us to see something that not many people, or even amateur astronomers, have ever seen. Everyone in my family was able to see the grayish pyramid that seemed to extend upward from Death Valley into the sky. After dark in the springtime is one of the best times to look for this ancient dust that is scattering the sun’s rays back toward us, and we just happened to be in the right place at the right time and bothered to go out and look. 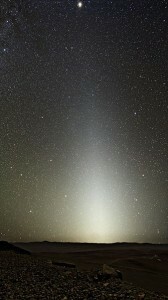 The Zodiacal Light is one of the items on my astronomical observing bucket list that I can now cross off, although I hope to see it again some night!